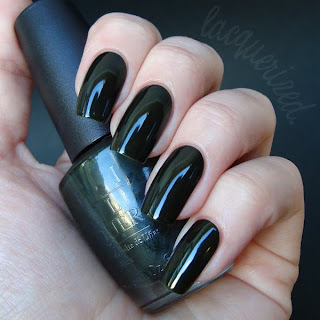 Lacquerized — A blog about nail polish: OPI - My Espana favorites & Upcoming Shrek Collection! OPI - My Espana favorites & Upcoming Shrek Collection! Hi guys! How is everyone? I'm a bit sick today but thankfully I had already prepared this post yesterday, so I only had to push the Publish button (well, and write this of course) :-D.
I wanted to show you my favorites from the Espana collection by OPI. This collection came out last fall, and I was pleasantly suprised! The colors that came out were wonderful, I liked almost every polish out of this collection. I'm sure you've all seen them by now but I wanted to show you two favorites of mine.. The first one, and my ultimate favorite, is Here Today... Aragon Tomorrow. This is a stunning blackened dark green. It has a jelly-like finish so It's incredibly shiny, even on it's own. The application was pretty good, the first coat went on really sheer but the 2nd coat makes up for that. I applied 3 coats, to get an opaque result. The other color I absolutely adore, is Pamplona Purmple. It's a beautiful purple creme, with an amazing application. 2 quick coats and you're good to go! After OPI's Absolutely Alice and the Hong Kong collection, they're already working on a new one: The Shrek After Forever collection. from left to right: Funky Dunkey, What's with the Cattitude?, Rumple's Wiggin', Who the Shrek Are You?, Ogre-the-Top Blue and Fiercely Fiona. I can't wait to try these! What do you think?